OLEDWorks latest panel is the Brite 2 - announced in March 2016. The Brite 2 offers a brightness of 300 lumens, a high CRI (>90) and an efficiency of 60 lm/W. 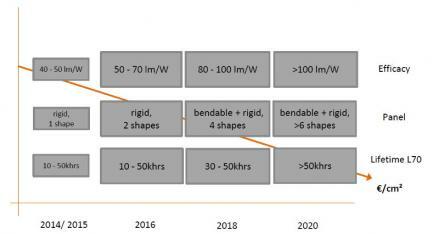 According to the company's roadmap, OLEDWorks aims to release 80-100 lm/W flexible panels by next year. 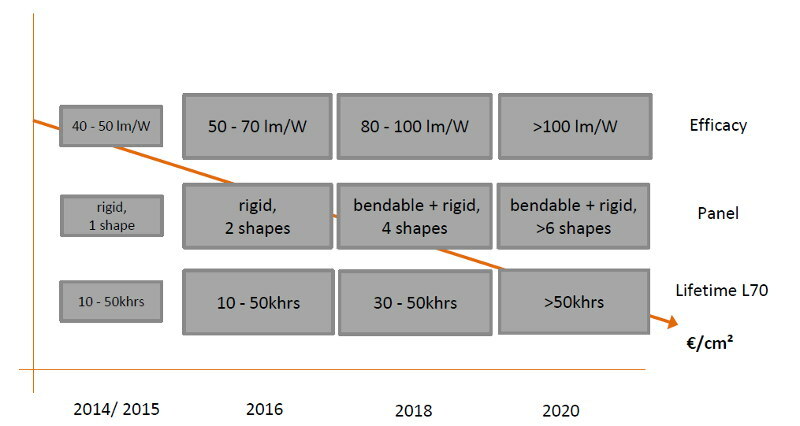 By 2020, OLEDWorks' panels will have an efficiency of over 100 lm/W and a lifetime of over 50,000 hours (LT70). OLEDWorks was established in July 2010 by former Kodak OLED business experts to develop a proprietary low-cost production process. In April 2015 OLEDWorks acquired Philips' OLED IP and production facility in Aachen. It is currently producing panels at both the US (low volume Amber lighting) and Germany (higher volume functional Lumiblade panels).